Former Y&R London creative chief and current 'gardener' watched the Super Bowl so you don't have to. Before we begin, let us be clear – my extraordinary, Greek god-like physique masks a total and fundamental disinterest in sporting endeavour of any kind whatsoever. This isn’t a new thing – I’ve always been resolutely, determinedly awful at anything that would cause my body to work up even the slightest of competitive sweats. During the 100m sprint at junior school, I would pretend to twist my ankle and stumble at the 30m mark, bravely limping to the finish line in order to be seen as "plucky" rather than the shitly running bag of polenta that I was and still am. This lack of ability in practice extends to an equal lack of capacity to watch sports, meaning today’s particular task of briefly reviewing some of last night’s Super Bowl ads has been giving me the right willies. If context is currently king, then I was nervously anticipating being subjected to a barrage of incredibly expensive TV ads dressed in Lycra and screaming tough-love motivational half-time speeches at me. I really needn’t have worried. The only context I can gather from the billions of dollars' worth of advertising laid in front of me appears to be the ad breaks themselves, and the only common executional thread being Hollywood-level celebrity. My god, the amount of celebrities in these ads. So much stardust, thrown in fistfuls with such random abandon at the executions. It is at times more than a little unsettling, as if the ad industry has been spending too much time on RedTube and suddenly discovered deepfake technology in order to randomly superimpose the faces of famous people on to their slightly ordinary ads. Oh, look – here’s Steve Carrell and Cardi B pissed away on a weak Pepsi ad! And Jason Bateman, looking suitably embarrassed in an ill-fitting lift boy outfit as he gurns his way through a clumsy script for Hyundai! There’s the less famous Wilson brother in a non-famous ad for Colgate. And Zoe Kravitz whispering nonsense about Michelob; there’s Michael Bublé for Bubly and Michael Sheen for Planters. There's 2 Chainz versus Adam Scott, and Buffy versus Olay, and Carrie Bradshaw versus The Big Lebowski, and Christina Applegate versus what any sane person would regard as a worthwhile attempt at a decent ad during the most high-profile ad break of the year. Crikey, Moses. But, still. Despite the slightly bilious feeling that consuming so very many slebs in one sitting has had on my fragile psyche, a couple of the Super Bowl extravaganzas definitely managed to pop for me.The bleak artificial intelligence existentialism of the Pringles ad tickled my dark spot, as did the rug pull on what at first sight seemed like a weirdly sickly Audi commercial. Perhaps I’m a little bit Blighty-partisan, or perhaps it’s because it features Harrison Ford playing straight man to a Boston terrier that looks and behaves exactly the same as my dog (@iambeastyface, if you’re looking to bulk up your Insta feed), but the Amazon spot from the UK’s Lucky Generals made me grin out loud. Random celebrity aside, it features some beautifully timed gags and is a worthy follow-up to the same agency’s equally strong Alexa spot from last year. It’s a fine thing indeed that we can joke our way to the top in such muscular American company. Finally, what for me was the most extraordinary (and, by some measure, most ambitious) noise-making Super Bowl work this year wasn't even an ad. 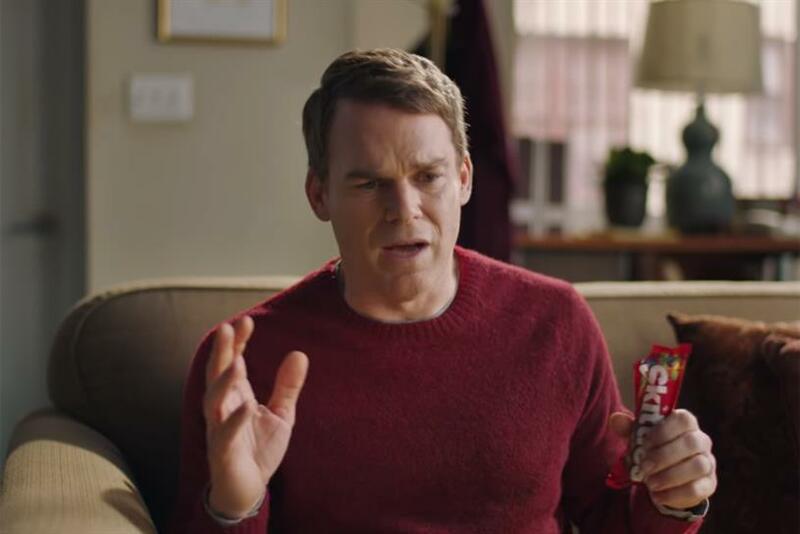 "Skittles commercial: the broadway musical", a 30-minute, one-night-only musical actually playing live on Broadway during the Super Bowl, featuring Dexter’s Michael C Hall. Incredibly cynical, subversive and self-referential (the storyline concerns Hall’s nervousness about ruining his career by appearing in a commercial for Skittles), but also ridiculously committed (the list of "proper" Broadway talent attached to the idea is genuinely impressive), it shows an agency (DDB) and brand giddily on top of its game. Obviously, I didn’t get to see the event for myself, but after watching the bizarre online trailer for the show I actually bothered to go on to Spotify and listen to the cast soundtrack – and I urge you to do the same. Advertising Ruins Everything is the title of one of the tracks, but if there was ever a compelling argument against such a currently widely held belief, then "Skittles commercial: the broadway musical" emphatically, irrefutably, hilariously makes it. Bravo, bravo, bravo.